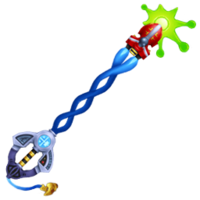 "A Keyblade with above-average reach that provides a balanced boost in Strength and Magic." 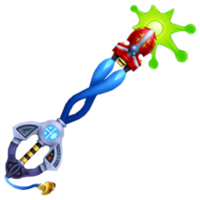 Hyperdrive is a Keychain for Terra's, Ventus's, and Aqua's Keyblades that appears in Kingdom Hearts Birth by Sleep. The tip of the Hyperdrive's blade appears to be the red police cruiser that Experiment 626 used to escape to Earth in Lilo & Stitch. 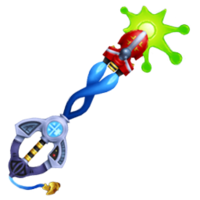 A light green blast of plasma comes from the ship's lasers, with three circular points serving as the teeth, while the shaft of the blade, which has a distinctive helix shape, is the blue exhaust from the ship's engines; for Terra's version there are three loops, while for Ventus's and Aqua's, there is only one. The guard has the appearance of spaceship technology, with a small display screen embedded near the base of the shaft. The hilt has three yellow and three black stripes, the same color pattern of caution tape. The Keychain resembles a thick blue wire fading from light to dark as it goes down, and the token is one of Experiment 626's blasters. A "hyperdrive" is a powerful type of engine that appears frequently in science fiction, including Lilo & Sitch and the Deep Space world. This page was last edited on 8 August 2016, at 10:06.